Winter finally arrived over the past week. This means colder weather and SNOW! With the snow comes snow shoveling. Over the last week, many of our clients have come in struggling with back, neck, or shoulder discomfort from shoveling. Paying attention to how you shovel can make a big difference in how you feel the next day. 2. Do a warm-up first. A tight, stiff body is asking for injury. Perform light jumping jacks and stretching. When you are shoveling, don’t forget to breathe out while lifting. Holding your breath while lifting can create significant pressure along your spine. 3. Layer your clothing. Layer with moisture wicking materials (stay away from cotton). You can shed a layer if you get too hot. 4. Use the right size shovel. Your shovel should be about chest high on you, allowing you to keep your back straight when lifting. A shovel that is too-short forces you to bend more to lift the load. A too-tall shovel makes the weight heavier at the end. (Note: Save your money – don’t buy a fancy ergonomic shovel; studies have shown that in some models, the hook end is too deep. Twisting to unload a shovel full of snow with this tool may hurt your wrists.) Also keep one hand close to the base of the shovel to balance weight and lessen the strain on your back. 5. Timing is everything. Listen to weather forecasts so you can shovel in ideal conditions. If possible, wait until the afternoon to shovel. Many disc injuries occur in the morning when there is increased fluid pressure in the disc. Also, go out multiple times to shovel while it is snowing so you won’t have to lift as much snow. 6. Drink lots of water. Drinking water frequently throughout the day helps to keep muscles and body hydrated. Be careful with hot drinks like coffee or hot chocolate. Coffee contains caffeine, which has a dehydrating effect and adds even more stress to the body. 7. Use proper posture. When you do shovel, bend your knees and keep your back straight while lifting with your legs. Push the snow straight ahead; don’t try to throw it. Walk it to the snow bank. Try to shovel forward to avoid sudden twists of the torso and reduce strain on the back. 8. Take your time. Working too hard, too fast is an easy way to strain muscles. Take frequent breaks to stretch your back and extremities. 9. Listen to your body. If you experience pain of any kind, stop immediately and seek assistance. minimize the chance for injury. If you do overdo it, see your therapist as soon as possible so they can help your body through the healing process. 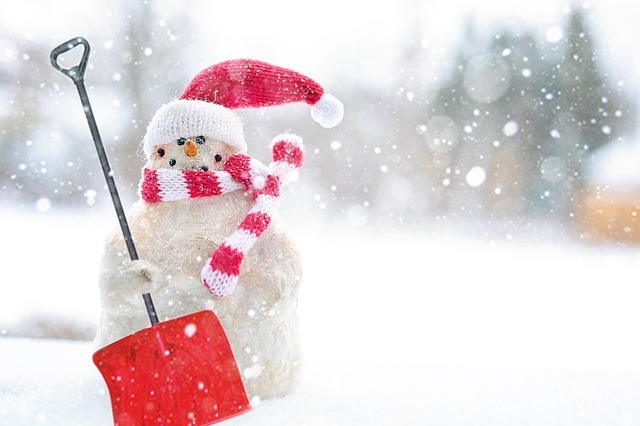 Use these tips to keep yourself safe during our winter snow shoveling season. Talk to your therapist if you have any questions and they can provide ideas on safe shoveling.